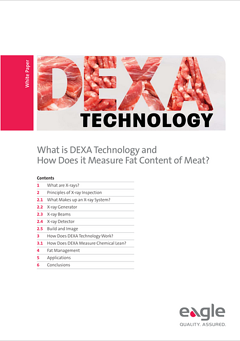 What is DEXA Technology and How Does it Measure Fat Content of Meat? DEXA has been used in many different industries for effective x-ray detection and now it’s sweeping the meat processing industry. As profit margins tighten, the industry is quickly learning the financial benefits using DEXA offers. Discover all of the fat measuring capabilities available with this latest technology. Download this 12-page guide to find out about the new global standard for meat processing inspection.